Home > Autodesk and other CAD industry articles and news > Building and Architectural Design Articles > How to delete your Autodesk Licensing information. We recently had a customer contact us and they mentioned that they had issues with activating their Autodesk software. They mentioned that something had gone wrong and the activation could not be completed. I checked their PC using remote tools like Teamviewer and I could also could not activate the software. I suggested that we uninstall the Autodesk software and thereafter also delete the activation and licensing information. In the example screenshot below you can see that the tool picks up all the Autodesk software on your PC and you have the opportunity to uninstall using one click. 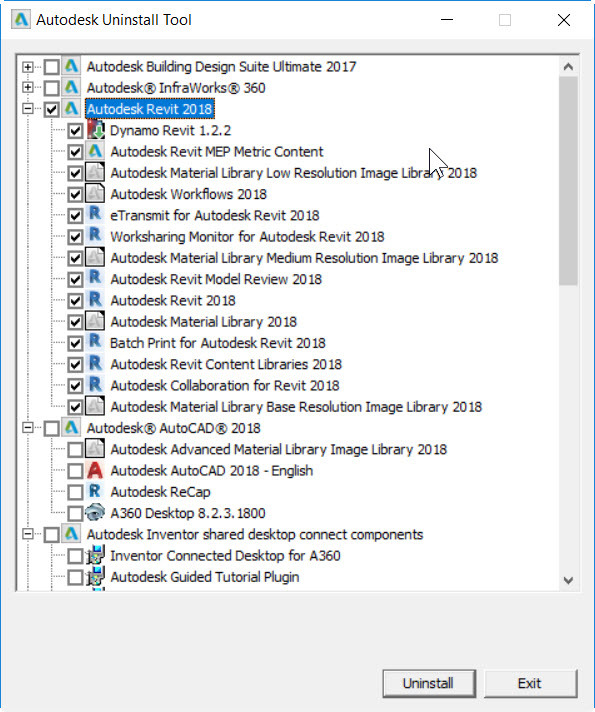 In the example I selected the Revit 2018 software to be uninstalled. Now that all the Autodesk software has been uninstalled you can delete the licenses. First look for the FlexNet directory in C:\ProgramData\ path and delete the content. Reboot your PC and begin the Autodesk installation from scratch.